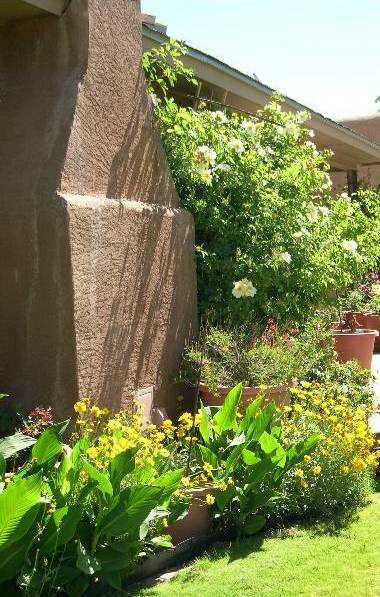 While many rose growers consider the rose to be “Queen of the Garden,”Â roses don’t bloom constantly and many are kind of bare at the bottom.Â Here in the high desert, they lose their leaves in the winter.Â So, many rose gardens look better with some other plants growing with the roses.Â Here are some that work well in the Albuquerque area. 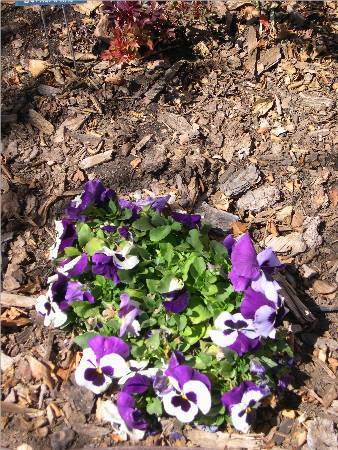 Pansies do extremely well in the high desert of the Southwest, providing color through the fall, then reblooming again in early spring until the temperatures get too hot.Â By that time, the roses are blooming.Â Pansies are technicallyÂ perennials, but are grown as annuals in this region. 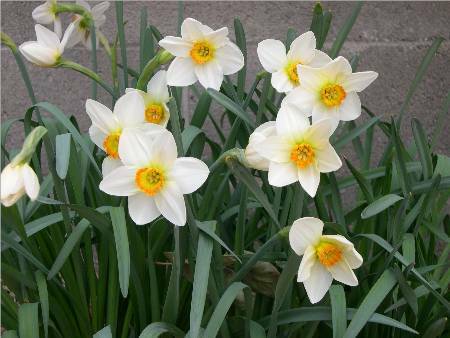 Spring-flowering bulbs such as crocus, daffodils, and narcissus bloom earlier than roses, and can also add color to the garden long before the roses are ready to bloom. 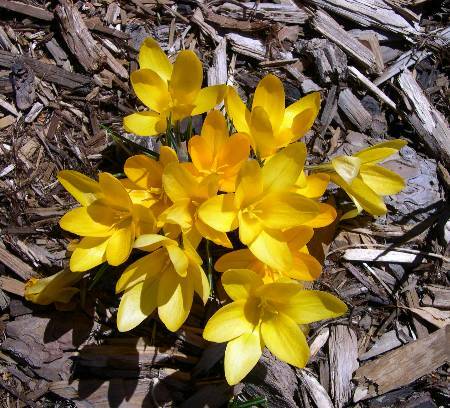 These need to be planted in the fall for spring bloom. This photo was taken March 14, 2005. 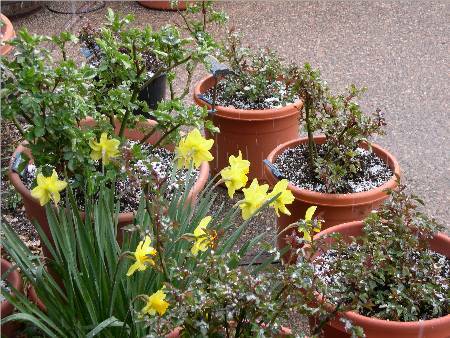 The daffodils are blooming, but a late snow is falling. So it goes in the high desert of the Southwest. Clematis can be a fabulous companion plant for climbing roses. The rose provides support on which the clematis can climb, and the rose also provides shade for the roots of the clematis. Clematis is picky in that it likes cool roots, with lots of sun on the leaves. Combining clematis with a climbing rose is perfect. 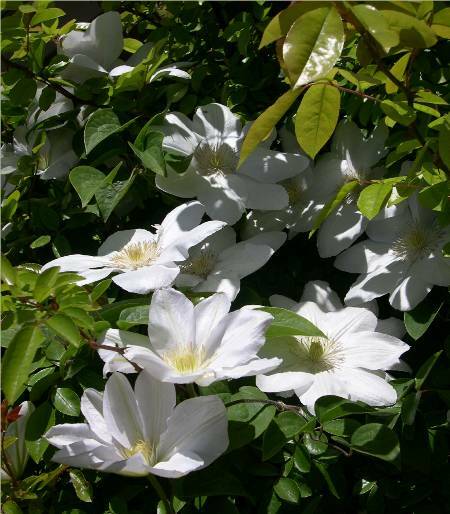 My personal favorite is the white clematis, Henryi, because it is tough and the color goes with everything. This is Henryi growing with Mermaid. The clematis blooms several weeks before the rose, and again late in sumer before the rose blooms in the fall. The perfect companion, in my opinion. This photo shows Mermaid climbing up the outside wall of the fireplace. At the base in a pot is an Autumn Sage that is just beginning to bloom. These grow extremely well in the high desert, and attract humming birds. The yellow flowers in front are coreopsis. 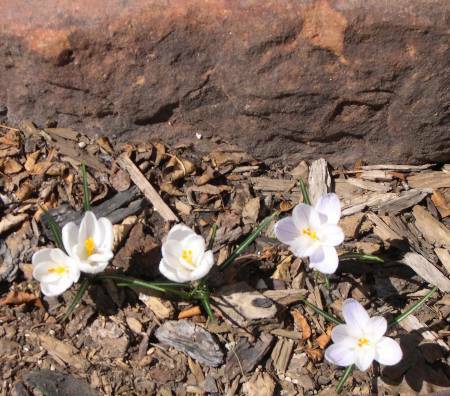 These flowers grow well and are self-seeding. 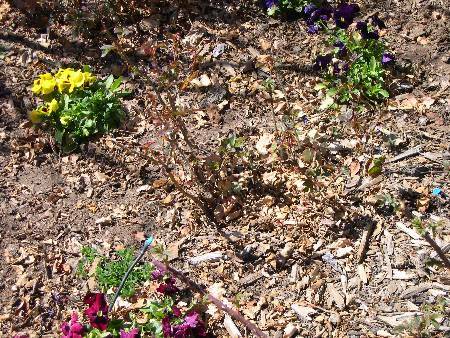 The only drawback is that you must cut off the old blooms or the plants look really terrible. But if you do keep the old blooms cut, the plant will bloom all summer. The large green leaves belong to canna lilies, which tend to bloom later in the summer when not much else is blooming. Canna lilies are also great for attracting hummingbirds. 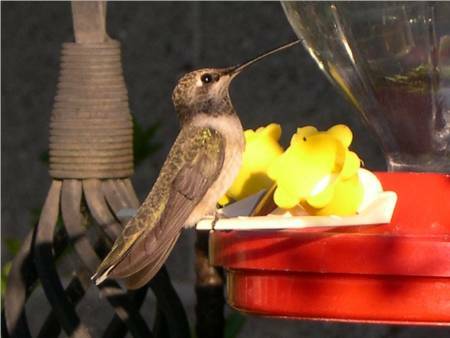 The photo of this hummer was taken at a feeder, but they seem to prefer certain flowers, such as those mentioned above, over the feeders. Hi, Jim. I just now came across this, so I apologize for taking so long to respond! It is a good read; thank you! I remember one of your images of the wildflowers in the back yard, with the bird bath. A long time ago I bought one coreopsis plant, and it has reseeded itself throughout the back yard. Cosmos that I planted from seed a couple of years ago is doing pretty well at naturalizing a portion of the yard. Hummingbirds, goldfinches, house finches, butterflies, bees, dragonflies, all sort of things love the cosmos, and it seems to thrive here in our desert. Some time ago I started getting sunflower volunteers from the birds. I liked them, so I started planting a few more exotic ones for photography. My yard looks a lot different now than it did when those images were made, and I think most of those were made with a little Nikon Coolpix. I know the one of ‘Mermaid’ was done in 2006, because it has just now reached that size again after being almost totally destroyed by a 22″ snowfall in December of 2006. I don’t have lantana, but that is a plant I ought to consider here. I’ve always liked it, and grew it in Arizona. I’m sure it looks great in your yard. My mom always kept a perfect yard, lots of flowers, etc., and my dad kept a perfect lawn. My son in Texas doesn’t grow flowers as such, but he is very particular about the trees and bushes in his yard. My mom finally has some help with her yard (very small, still beautiful), but it took her until she was 90 to allow any help!